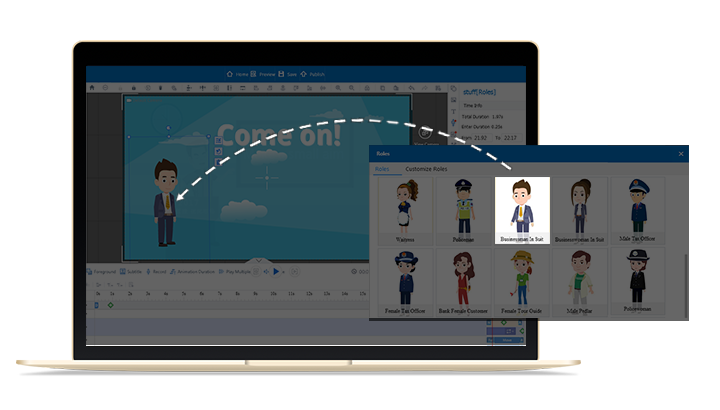 Animiz, the creative cartoon explainer video tool, provides a background editor for users with which you can customize background for your scene, each of scenes. There are also many pre-designed background image(Simple, Landscape, Person, Video, Line and more other classification) and color for you to choose from. Just import an image and you can apply it for one of your scene. If you want to make a unique background color, you can choose to give it the advanced settings. Select the colors and mode like pure, linear or radial. You would easily find that there are hundreds of shapes in Animiz library, arrows, rectangles, circles, dialogs, etc. Add any shapes at your will to free design your scene layout. 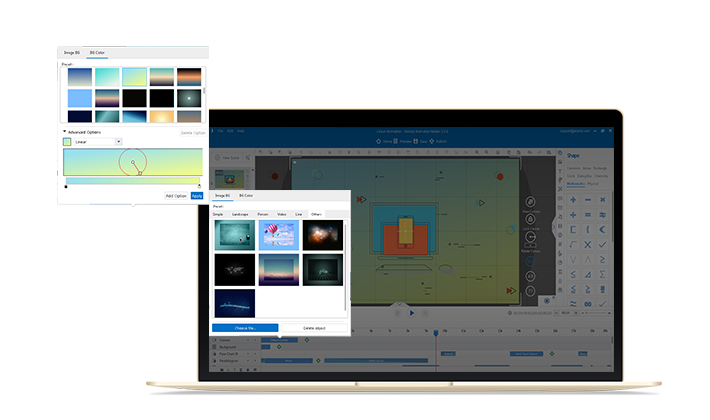 One thing should be mentioned that you can customize the color, size and angle of the shapes you add on the canvas. Dialog box, Chemistry, Mathematic and Physical shapes are all the good choice for explaining the science. Animated roles are indispensable to cartoon explainer video. If the video is served the business, there are several kinds of business men and women or employer and employee for you. Each kind of animated role includes different emotions and actions so that you can express any contents as you like. With the help of animation editor in Timeline, you can add appropriate animation effects for the roles to make them much more smoothly and true. There are more than 300 animation effects ready for embellishing your cartoon explainer video. The hand-draw animation effect is the most representative one. 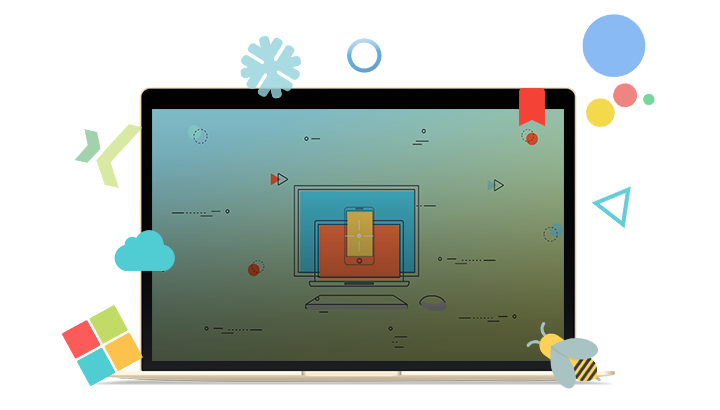 This engaging animation effect would help to make your video more vivid and, of course, make audiences’ eyes fix on your video during presentation. With the hand-draw animation effect, the object is drawn from the beginning in black-and-white lines to the colorful picture, like a process of making a magic. Get an Animiz account and choose a business online video template to begin creating your video. Customize background image for each scene in your cartoon explainer video. Choose some shapes to decorate the scene layout easily and customize the color, size and angle. Combine some animated roles together to make some scenes like role-play dialogue. Add the special hand-draw effect for some objects on the canvas to make them more vivid and true.